MALDEN, Mass. -The Arlington Spy Ponders advanced to the finals of the Division 2 bracket in the 2017 Comcast I.A.A.B.O. Board 27 Basketball Tournament by taking down the Marlborough Panthers, 59-54, in overtime on Sunday afternoon at Malden Catholic high school. With the win, Arlington (18-1) extends its winning streak to ten games, while Marlborough (12-7) has now lost four straight contests. The Panthers have not picked up a win since they clinched the Midland-Wachusett B regular-season title on February 3rd with a win over division rival Nashoba. The teams were very evenly matched in the first quarter. Two 3-pointers by Kevin Short (9 points, 3 rebounds) put the Panthers ahead 8-3. Arlington freshman Bensley Joseph also hit two shots from behind the arc in the opening period, the second of which gave Arlington a 9-8 lead. Joseph scored a team-high 16 points, to go along with 4 rebounds. On the defensive ends, Joseph forced five Marlborough turnovers. Marlborough tried to force turnovers by using a full-court press throughout the contest against Arlington, but the Spy Ponders passed the ball up the court and were able to make productive plays despite the pressure put on by the Panthers. Arlington head coach John Bowler said that his team stayed calm and was able to handle the pressure well. The two teams stayed within one possession of each other for the remainder of the first period, and the Spy Ponders led 13-12 after the first eight minutes. Joseph helped turn defense into offense at the start of the second quarter. A steal by Joseph led to a layup by Arlington senior captain Colin McNamara (12 points, 5 rebounds), which sparked a 12-2 run by the Spy Ponders. McNamara punctuated Arlington’s run with a corner three, which gave Arlington a 25-14 lead. After a rebound and putback by Marlborough junior Chris Doherty, who led all scorers with 23 points, to go along with 17 rebounds and 2 blocks, buckets by Joey Pazzia and McNamara opened up a 29-16 lead for Arlington. Marlborough closed the quarter on a 5-0 run, courtesy of a three-pointer by Ethan Kirsch and a floater at the first-half buzzer by Owen Cappadona (9 points, 3 steals). Arlington’s lead at halftime was 29-21. The Spy Ponders picked up the pace of the game in the second quarter, forcing turnovers and defense and turning those steals into layups and baskets in transition. They played aggressively on defense, collecting 12 steals against Marlborough. Coach Bowles said that the Spy Ponders always play with intensity on the defensive end. Bowles said that his team’s goal is to “wear teams down” in the first half, with the hope that it would lead to turnovers by their opponent in the second half. However, the Panthers came out of the locker room with a new energy and intensity, brought in large part by Joao Mendes, who was not on the court during the first half of the game. Marlborough outscored Arlington 11-3 in the third quarter, with Doherty and Mendes combining to score all 11 of the Panther’s points in the third period. On the defensive end, Marlborough played with desperation, looking to force turnovers on every trip down the floor, and closing out on Arlington’s shooters. Arlington’s only bucket of the third quarter was a 3-pointer by sophomore Nicholas Karalis, which extended Arlington’s advantage to 32-26. Two baskets by Mendes and a layup by Doherty allowed Marlborough to close the quarter on a 6-0 run, and the two teams were tied at 32 heading into the fourth quarter. Marlborough picked up right where they left off to start the fourth quarter. A steal and driving layup by Mendes, followed by another bucket by Doherty, gave the Panthers a 36-32 lead. After Doherty scored, Arlington called a timeout with 7:01 remaining in the fourth quarter. Coming out of the timeout, Arlington captain Dominic Black (11 points, 8 rebounds, 2 steals) hit a three-pointer, diminishing Arlington’s deficit to 36-35. Cappadona responded with a three-pointer of his own, followed by a lob pass from Cappadona that led to a one-handed slam dunk by Doherty that brought the Marlborough fans to their feet and forced Coach Bowler to call another timeout. After the timeout, the Spy Ponders went on an 8-0 run, with Joseph scoring 6 points over that span. A layup by Joseph gave Arlington a 43-41 lead. A rebound and putback by Doherty, followed by another basket by the 6-foot-8-inch forward, provided the Panthers with a 45-43 lead. 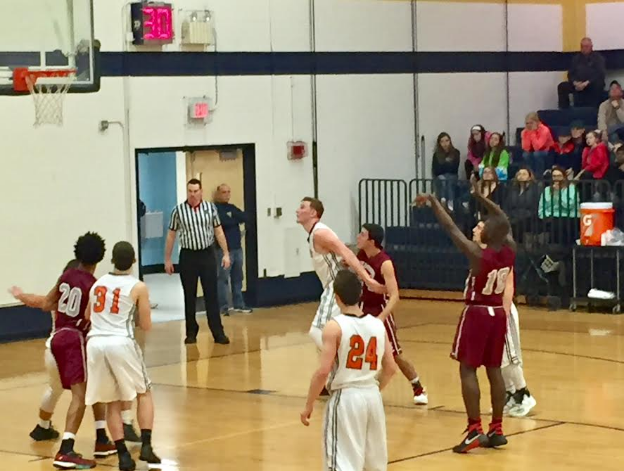 McNamara and Short exchanged three-pointers, giving Marlborough a 48-46 lead. A steal by Joseph led to a basket by Black, which tied the game at 48. Both teams had a chance to win it with under a minute remaining in regulation. Mendes lost the ball out of bounds while driving hard to the basket, and a floater by McNamara at the buzzer rimmed out, sending the game into overtime. After Doherty and Black traded baskets, Joseph banked in a three-pointer from the wing on the left side. A basket from behind the arc by Karalis opened up a 56-50 advantage for Arlington. A steal and a layup by Joseph put the Spy Ponders up 59-52 and put the game out of reach of the Panthers. Arlington showed a lot of resiliency in being able to stay focused after blowing a 13-point lead. Even when Marlborough took the lead, the Spy Ponders stepped on the gas, picked up the pace, and knocked down shots when they needed to. For Marlborough, head coach Scott Bauman has to be happy with the fight the Panthers showed in the second half after being dominated in the second quarter. They never gave up and showed the ability to play with a deeper Eastern Mass. team. Losing four straight is never fun, especially late in the season, but there are positives the Panthers can take away from this game, especially the play of Doherty. Doherty was the catalyst during their second-half comeback, and he played with better control on defense than he has in the past. Doherty also brought the ball up at times and seemed more comfortable with putting the ball on the floor. The two teams will wrap up their regular seasons tomorrow, where Arlington will play the winner of the St. Mary’s-Malden Catholic game in the finals of the D2 bracket of the Comcast Board Tournament, while Marlborough will take on the loser.